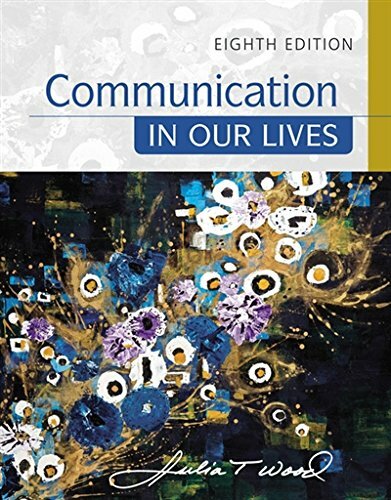 1305949544 -COMMUNICATION IN OUR LIVES, 8th Edition, provides everything students need to strengthen their interpersonal, group, public speaking, and media literacy skills — as well as demonstrates the value of communication in their personal and professional lives. Award-winning scholar Julia T. Wood combines skills development with the latest research and theory by prominent communication scholars. Praised by instructors and students alike, the text features an engaging, personal tone, highly readable style, and frequent Student Voice sections that explore how past students have experienced key communication concepts. The eighth edition integrates social and cultural diversity throughout, provides an early emphasis on public speaking, expands coverage of mass and social media, and includes a new focus on health communication. In addition, interactive, online study tools allow you to customize the text to your course and help your students become more confident and effective communicators.